We’ve been quite busy over here at TulipChain Photography HQ. The past two weekends have been spent working on the construction of Chase Jarvis’ DIY Camera Dolly. After multiple trips to various hardware stores, much sawing, even more drilling, and a couple “oh screw it!”s we’re finally done! Check it out! Here’s the easy part: the track. 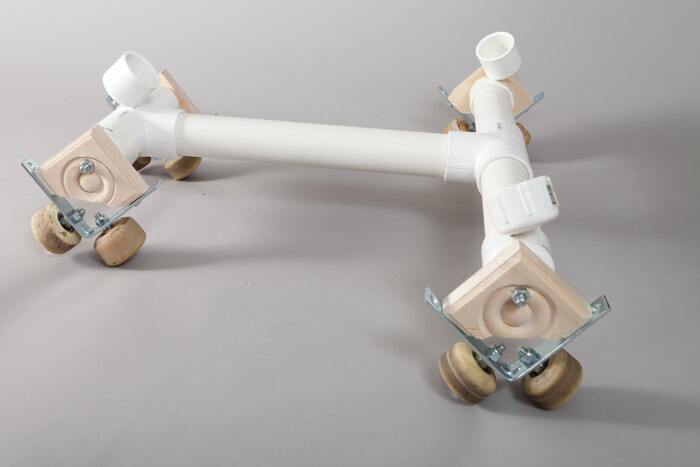 This took two long pieces of 10′ long PVC pipe (we bought 1.75″ diameters) and four elbow joints. 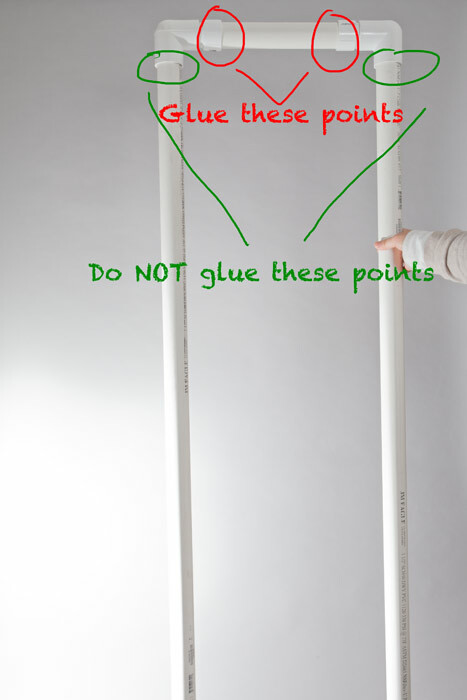 We also used some PVC pipe cement for stability but that’s optional. We hack-sawed two long pieces and two short pieces. It’s important to know which tripod you’ll be using so that you can accurately measure the short pieces which establish the width of the track (which should match the footprint of the tripod). It’s pretty self explanatory, especially if you view the image (to the left) larger so I’ll just note this: we glued the two inner end pieces but NOT the outer joints. This allows for changing the long pieces out if you want a longer or shorter track and makes it easier to break everything down for transport. The truck required a little more thought and planning. First we had to make sure to measure everything carefully as this was the part of the dolly where the tripod (and beloved camera!) would rest. Not only did it have to be the right size, it also had to be sturdy. Jarvis’ truck seemed to be a mixture of bolts and tape but we wanted something a little sturdier. We ended up using a combination of screws/bolts and epoxy. 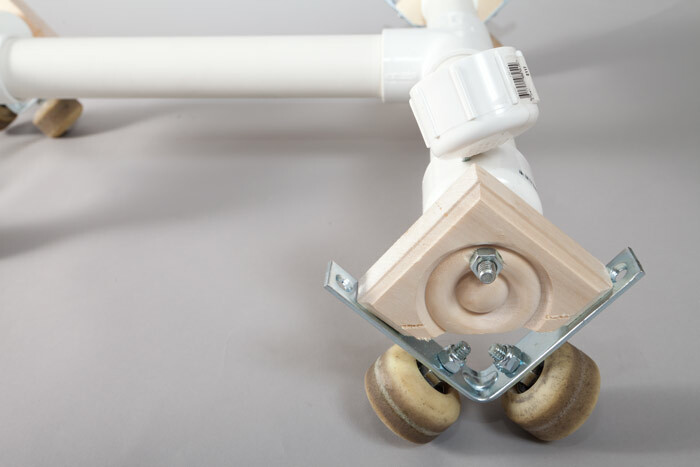 We used 1.75″ diameter PVC pipe (the same that we used to make the track), two “T” joints for the PVC pipe, seven end caps for the PVC pipe (four for the ends that connect to the wood blocks and three for the tripod to rest in), lots of screws and nuts, locking washers, eight skateboard wheels, four metal “L” brackets, four wood squares (I found these in the decorative molding aisles at Home Depot), and some PVC pipe cement which, again, is optional. Unfortunately since my main task was to distract the eager-to-help puppy I can’t give you step-by-step instructions but, hopefully, the close up images will give you a sense of how to build this. The only part that is not obvious from the photos is that there are two screws holding the wood piece to the metal L bracket. The end caps on top of the truck, which hold the tripod feet, were screwed *and* epoxied on and these are where the tripod legs rest. Now, go forth and dolly! And send me some videos you make with it! I’d love to see them! How long is your track? Aren't you supposed to buy me a drink before you start asking questions like that? Sure, pile all that track into your car and we'll meet up. haha We had enough PVC to make two tracks - one long and one not-so-long (sorry, my tape measure doesn't reach far enough to give anything more precise). The long track fits in my car (barely) so I think it's about 9' long...? The long track is 10', the short track is about 6'. Theoretically, it should be possible to make the track about as long as you want by splicing together the longest pieces of PVC you can find. Just need to make the joints as smooth as possible. I was just wondering. I have freinds who have been making these dollies for years. Many of them had vans to haul around long PVC pipes. I which there was an easier way to get a smooth move without a track dolly, but there really isn't. I have a steadi-cam knock off, but you need to keep your moves very limited before it goes into major wabble mode. On the other hand it gives you some major movement in non real estate situatuions. Love the chili caliente movie. Recipe? Looked like Scott added chocolate, and no spices? Looks good! Seems like you had fun, too. How did the chocolate taste in this dish? What a cool little dolly you guys built! Saw this on PFRE and came here to have a look. Nice work! Hey Ryan! Looking forward to seeing the results from yours! I just googled this: dolly track chase jarvis and your pages came up #1 and 2...Chase's came after.